описание (rus) WingFTP Server - является профессиональным кросс-платформенным FTP-сервером, характеризующийся высокой скоростью, надёжностью, удобством для пользователей. Позволяет отслеживать FTP сервер в реальном времени, следя за каждым пользователем, подключенным к серверу и сбор подробной информации. Он включает в себя новый набор современных инструментов (консоль администратора, Task Scheduler, web-пульт), скрипты позволяют пользователям расширить сервер, создать виртуальные каталоги для простого обмена файлами. description (eng) Wing FTP Server is an easy-to-use, secure and feature-rich enterprise FTP Server that can be used in Windows, Linux, Mac OSX and Solaris. It supports multiple file transfer protocols, including FTP, HTTP, FTPS, HTTPS and SFTP server, giving your end-users flexibility in how they connect to the server. 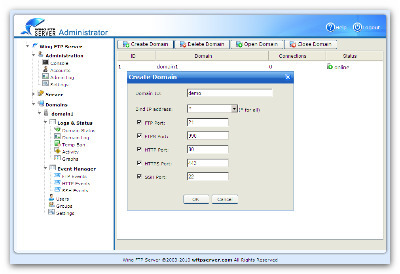 And it provides admins with a web based interface to administrate the server from anywhere. You can also monitor server performance and online sessions and even receive email notifications about various events taking place on the server. Improvement - CuteFTP can't connect to the SFTP server, with the error message "Failed to create the ssh channel". Fixed a bug - Can't jump into the virtual folder with some SFTP client software. Fixed a bug - When ending the SFTP session, socket will be shutdown directly before closing the SSH channel. Improvement - Improved the compatibility for the SFTP library "phpseclib" which has "Failed to exchange the keys" issue. Improvement - Updated OpenSSL to the latest version 1.0.2n. Improvement - Windows version moved to Visual Studio 2017 and its CRT library. Added a feature - File request link is now available in web client, you can request files with just a link. Added a feature - Introduced a new file uploader in web client, supports both HTML5 and Flash, supports Drag&Drop and multi-threads. Improvement - Added sorting function for the IP/file access rules under web admin. Improvement - Enhanced the performance of the SFTP file uploading. Improvement - Added a HTTP header "X-Content-Type-Options:nosniff". Improvement - Added a domain option to disable ECDSA host key. Improvement - Updated the Help Manual for Wing FTP Server. Fixed a bug - When creating SSH host key under some folder, the key path will be incorrect. Improvement - Updated OpenSSL to the latest version 1.0.2p. Improvement - Can't send email via some SMTP server like Office365. Fixed a bug - Under the mobile UI of the Web Client, can't select the first file when existing 2 rows of toolbar buttons. Fixed a bug - Can't input "My email address" when sending a web link. Improvement - Updated OpenSSL to the latest version 1.0.2q. Fixed a bug - When generating thumbnails with some special conditions, WingFTP service could crash. Fixed a bug - Service might crash when doing "Zip File" with some conditions (Windows only). Fixed a bug - Web client operation "Zip File" will fail for non-English file/folder name (Windows only). Fixed a bug - Fixed a possible crash when handling FTP passive connection. Fixed a bug - For the Event Manager, can't execute 3rd party program when the parameter includes double quotes. Improvement - Added an option "Listen on single IP" for the Wing Gateway settings. Fixed a bug - Fixed a possible crash when handling SFTP file listing. Improvement - SFTP server listener may stop working when have large traffics. Improvement - Supported password for the SSH host key now (Windows/Linux version only). Fixed a bug - FTP server will return "550 read file error" when resume download from the end of file. Fixed a bug - Can't get the latest version information in some situation. Improvement - Domain/Server statistics will be updated in time. Improvement - Removed Flash uploader under web client for IE/Edge browser. Improvement - Improved the web administration interface for old IE browser.